Adverse conditions such as dry air indoors, smoke, dust, wind or cold dry out the nose. A dry nasal mucous membrane can no longer carry out its actual task of moistening and cleaning the inhaled air. The protective lining of the nose becomes damaged. During a cold and flu the front section of the nose can sometimes become sore; the nose turns red and is often painfully irritated. Soothing moisturisation and care can aid a speedy regeneration of the affected areas and restore the naturally moist nasal lining. The vitamin A containing ointment forms a protective, regeneration-supporting and long-lasting layer at the nasal entrance, thus moisturising the skin and mucosa. 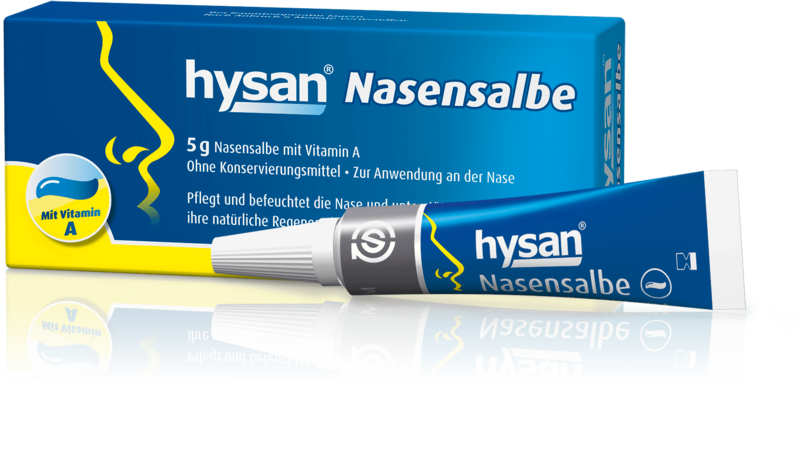 hysan® Nasensalbe is therefore very well suited for the intensive and long-lasting care of the nose.